He must be used to this by now. Judging by the headlines alone, Chief Justice John Roberts established himself as a bona fide moderate long ago, and with such authority that the moniker gets bandied about as if it were an empirical fact. Based on this kind of coverage, it’s no surprise that Democrats and independents widely believe in the myth of Roberts-the-moderate. But it is a myth, and the fact that so many people don’t understand that is both disturbing and a real danger to the progressive agenda going forward. Polling for the judicial watchdog Pack The Courts, completed by YouGov Blue, suggests that public opinion about the Court is driven by asymmetric partisanship. The data shows that Justices Roberts, Ruth Bader Ginsburg, and Sonia Sotomayor are the most popular justices. 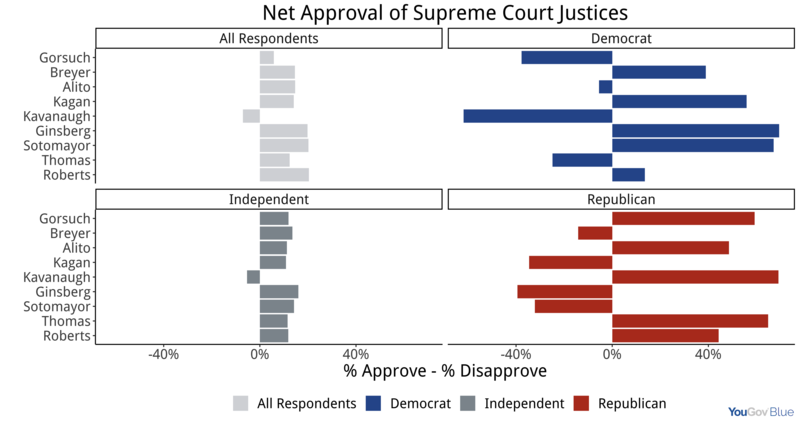 Independents narrowly approve of all the Justices except for Brett Kavanaugh. But while Republicans have negative perceptions of every justice appointed by Democrats, Democrats have a positive view of Roberts. Across the 1,282 voters we polled at the end of January of 2019, we found that only Kavanaugh had a net negative approval rating, and even he is only seven percent under water. Across all voters, 38 percent approve or strongly approve of Justice Roberts, compared to just 18 percent who disapprove or strongly disapprove, giving him a net approval of 20 percent. (Twenty-eight percent of respondents were neutral and 16 percent weren’t sure how they feel about him). Thirty-two percent of Democrats approve of Roberts and 19 percent of Democrats disapprove of Roberts. About 55 percent of Republicans approve of Roberts and just 11 percent disapprove, while 33 percent of independents approve and 21 percent of independents disapprove of him. The perception problem is not limited to favorability. Few voters, even Democrats, believe that Roberts is “very conservative.” Just seven percent of Democrats, five percent of Republicans, and three percent of independents viewed Justice Roberts as “very conservative.” While Democrats are more likely to view Roberts as “conservative” than “moderate” (33 percent to 23 percent), they are disproportionately likely to report not knowing. Thirty-two percent of Democrats said they could not place Roberts’ ideology, compared to 20 percent of Republicans and 21 percent of independents. These findings reflect the range of political awareness among the general public. To gauge our respondents’ political knowledge, we also asked them how many justices sit on the Supreme Court and to identify the chief justice of the United States. Roughly 48 percent of our respondents answered both questions correctly. Fifty percent of the politically knowledgeable Democrats identified Roberts as conservative, and seven percent as very conservative. Just nine percent of politically knowledgeable Democrats did not have an opinion of where Roberts fell ideologically. Despite these numbers, Roberts’ record and judicial philosophy skews much further right than moderate. John Roberts has attempted to cut a non-partisan, possibly centrist figure. He scolded President Trump when Trump complained about an “Obama judge” and has wrung his hands in public over the Court’s image. But inside the Court, things are much different. For 13 years before the confirmation of Brett Kavanaugh, Roberts worked diligently to produce 5-4 decisions that swung overwhelmingly conservative. He voted with the conservative majority in such consequential and devastating cases as Shelby County v. Holder, which gutted the Voting Rights Act; Citizens United, which flooded politics with dark money; and DC v. Heller, which expanded gun rights dramatically. In the face of such a record there has been a disproportionate focus on Roberts rare apostasies from conservative dogma (such as his two decisions blocking conservatives from gutting the Affordable Care Act, his public comments about the Court, and his highly conditional abortion decision last week). As such, the average voter polled may mistake these headlines as the rule rather than the exceptions. Data from FiveThirtyEight shows that Roberts has only cast a pivotal liberal vote five times. If Roberts feels unconstrained politically, there are reasons to worry he’ll begin more aggressively striking down progressive laws and priorities, and he’ll face significant pressure to. It’s near certain that conservatives will work to convince the Courts to strike down a Green New Deal, Medicare for All or a wealth tax. 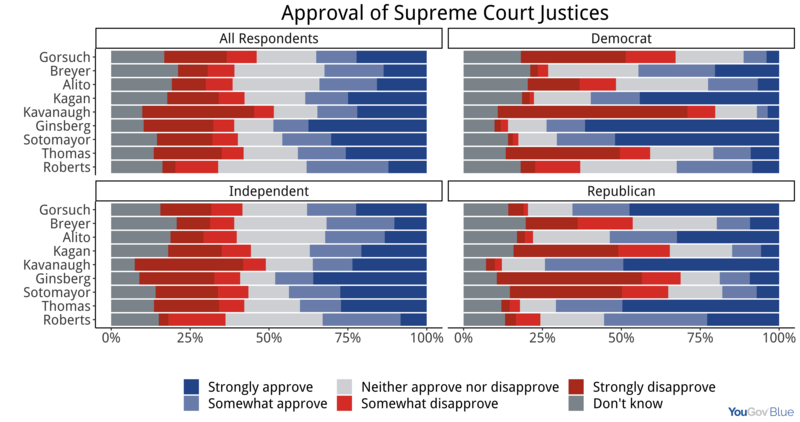 There is some good news in our data: Democrats don’t view the Court as a neutral arbiter, and instead believe that justices allow politics to determine their decisions. It is not uncommon for partisans to lower their approval of a branch of government when their party is not in power, and the current environment is likely no exception. A majority of Democrats believe the current Supreme Court mostly plays politics, while a majority of Republicans believe the Court mostly just interprets the Constitution. Going forward, it’s important for progressives to demystify the Court, and give their voters a sense of Roberts’s real agenda. If we don’t, we might spend the coming years watching Roberts single-handedly gut the progressive agenda, and have no political recourse. Democrats must prepare to reverse these illegitimate Supreme Court decisions one way or another. But first they have to start paying attention.